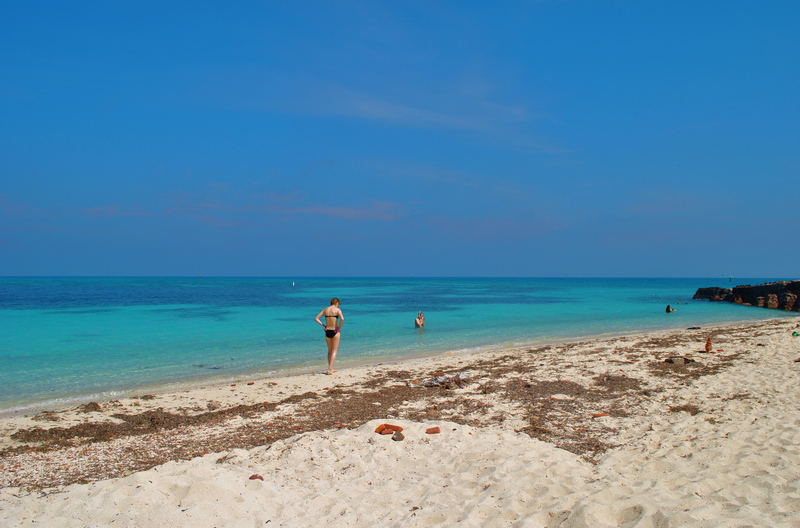 As we were planning our Key West itinerary, we came across a stunning photo of a beach located at the Garden Key. 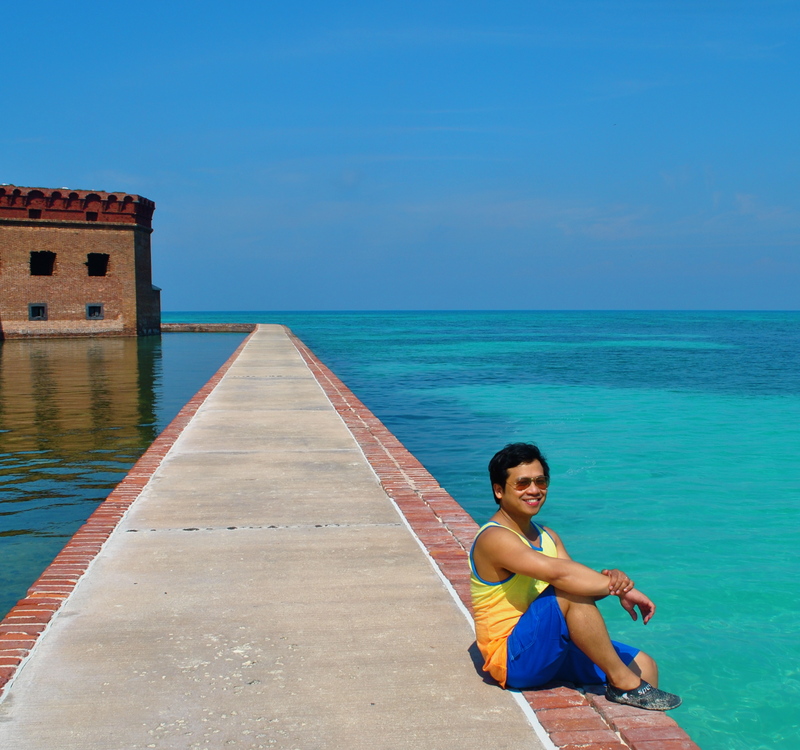 We never knew that almost a hundred miles west of Key West there’s a place that is out of this world! 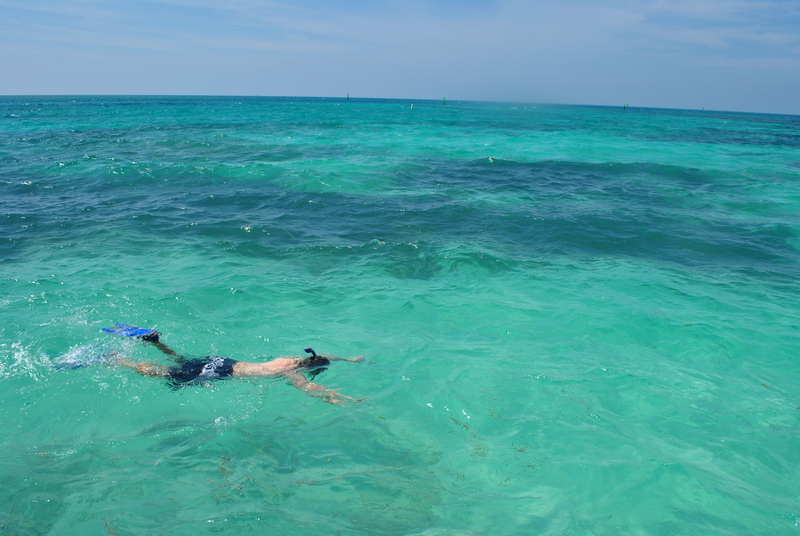 Our minds were already framed on what to expect from the beaches on the Florida Keys that are located in the world’s third largest coral reef that makes the area excellent for diving and snorkeling. 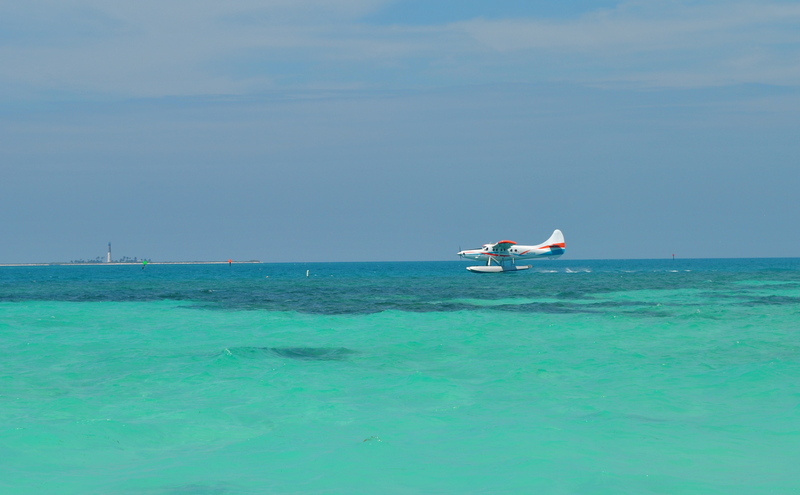 Key Largo, one of the keys, has even earned the title of the Diving Capital of the World. 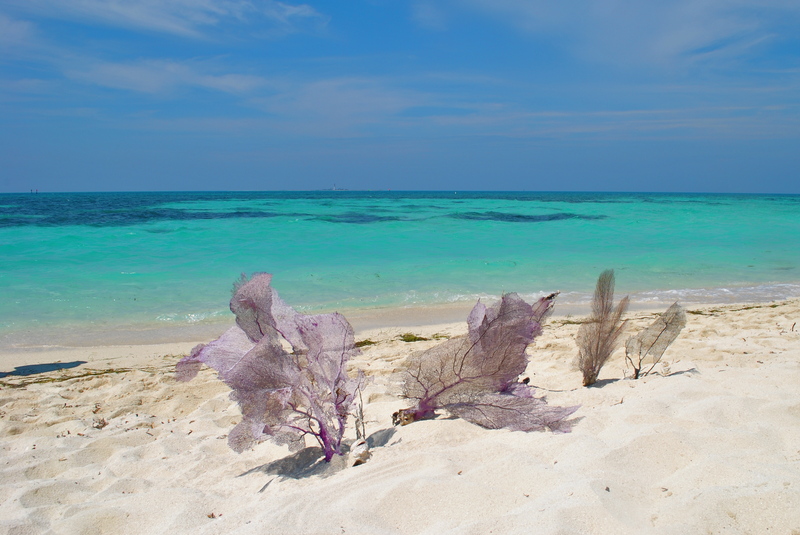 However, this means that because of the coral reefs filtering the waves before they reach the shores on the islands, there would be less pulverization of the sand so there are less fine, white sand beaches around the islands. 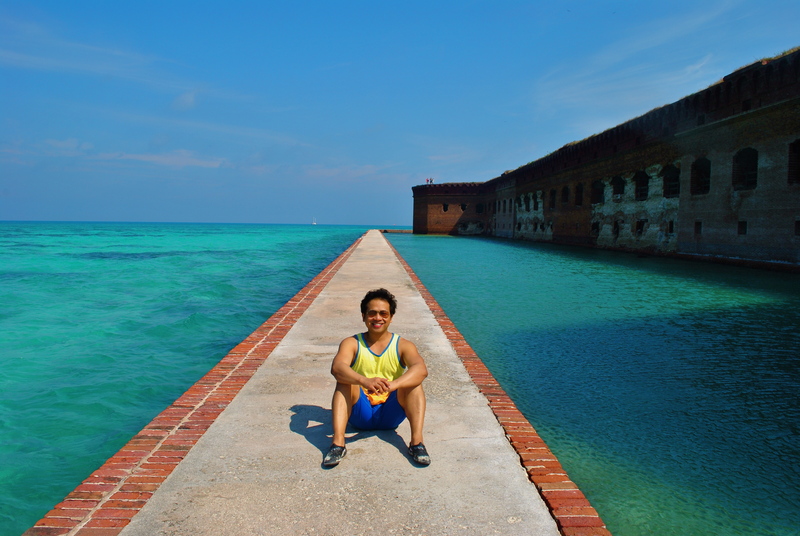 That captivating scenery of the Dry Tortugas National Park’s South Swim Beach convinced us to make the place one of the major destinations that we will be visiting during our first trip to the Florida Keys. 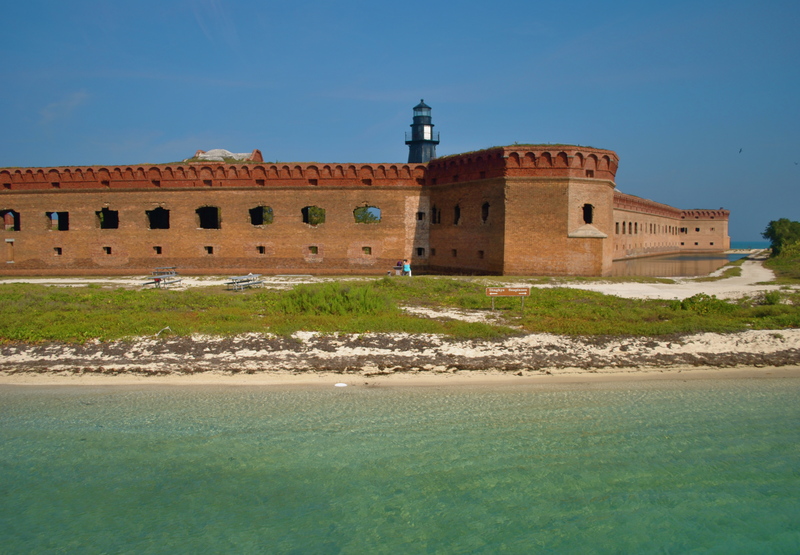 Situated between the Gulf of Mexico and the Atlantic Ocean, the remotely located Dry Tortugas National Park is 70 miles west of Key West, Florida which is the southernmost city in the continental United States. It is composed of six pristine islands of which the Garden Key is the centerpiece island. 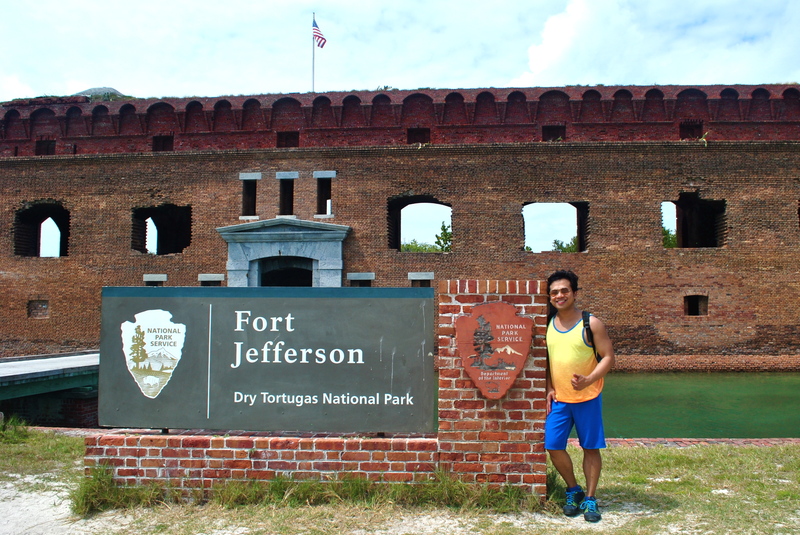 It is also where Fort Jefferson is located. 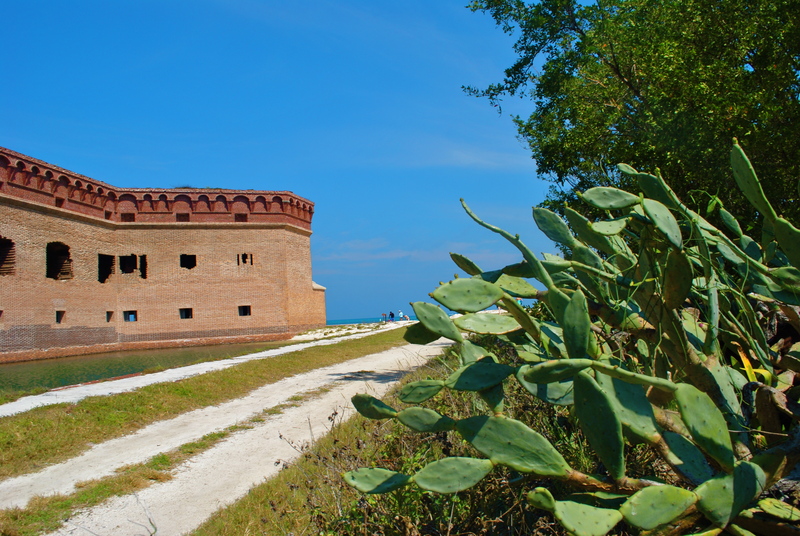 It is America’s third largest and most spectacular coastal fort. 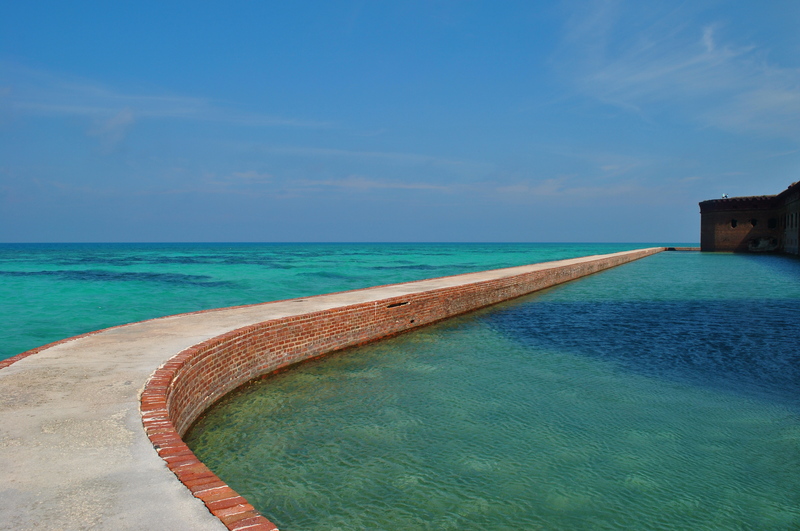 Access to the Dry Tortugas National Park is only possible from Key West. 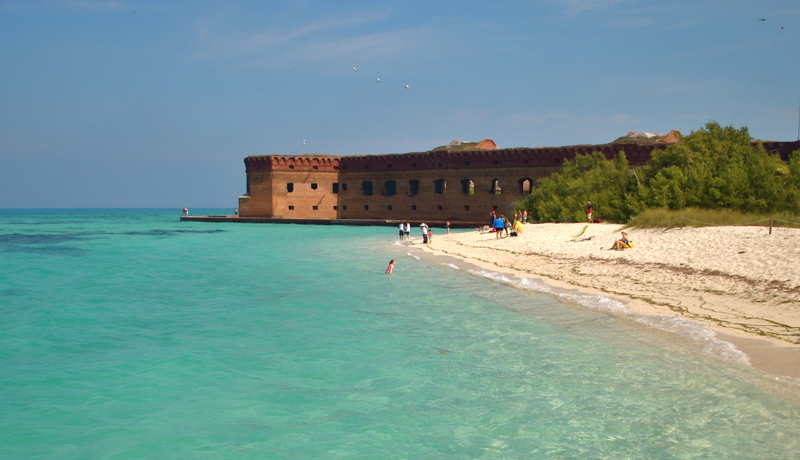 You can fly to either Miami or Fort Lauderdale and take a scenic four-hour drive to Key West. 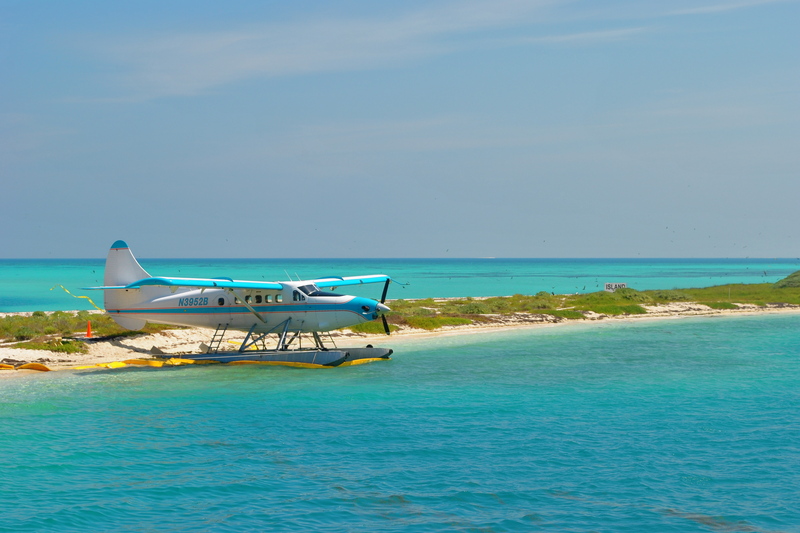 You can also fly direct to Key West but I would not suggest this option because you will be missing the breathtaking views of the ending stretch of U.S. Route 1 that terminates at Key West. 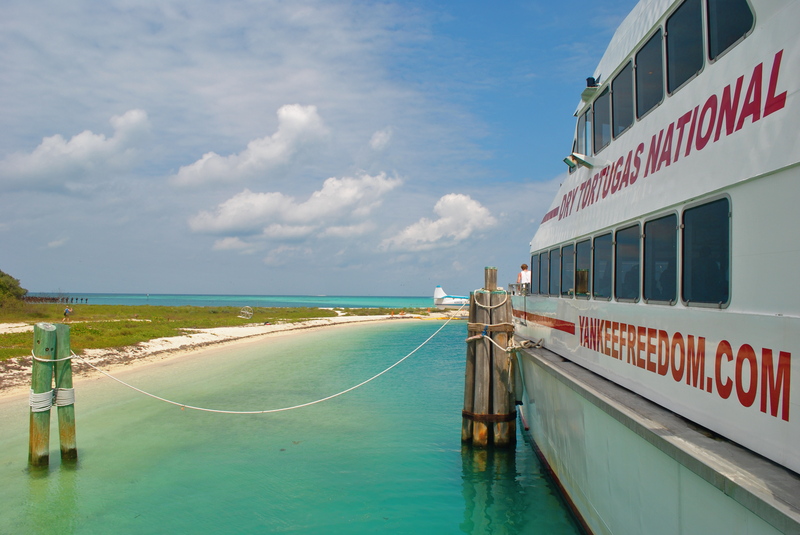 From Key West you can either take the ferry to Dry Tortugas National Park which is exclusively offered by Yankee Freedom III (US$190 per adult person for a return trip including breakfast and lunch) or you can take a sea plane which can be chartered at this link (US$299 for a half day tour or US$525 for a full day tour per adult person). 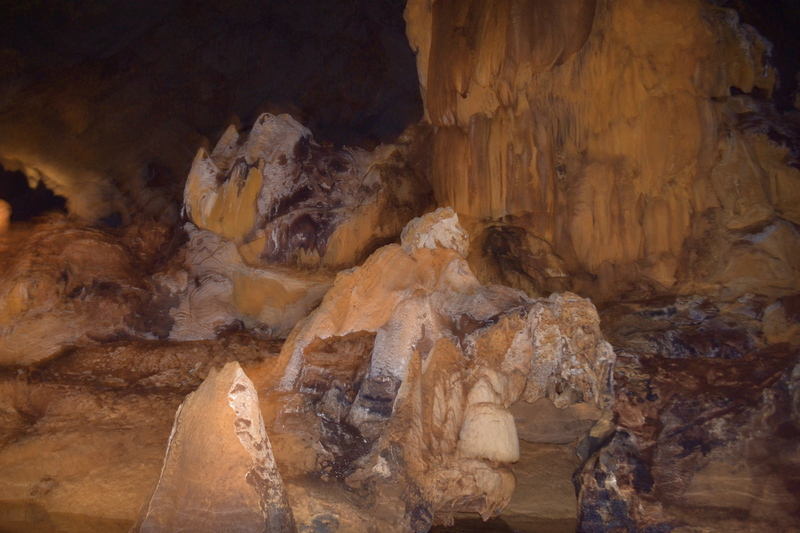 We just opted for a full day tour so what I will be presenting here will just be activities for those who are on day tour, except for the camping tips. 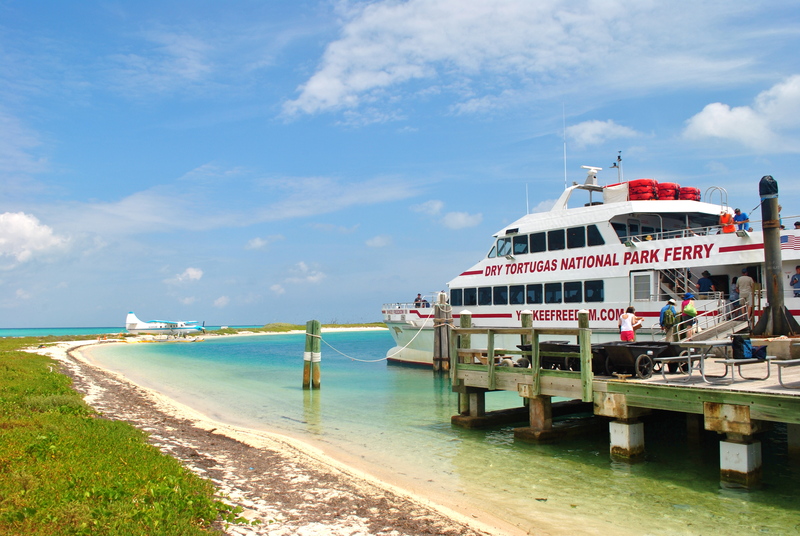 We took the ferry that left Key West at 8 a.m. and reached Dry Tortugas National Park at around 10:30 a.m. For the day tour you have exactly four and half hours to spend on the island. 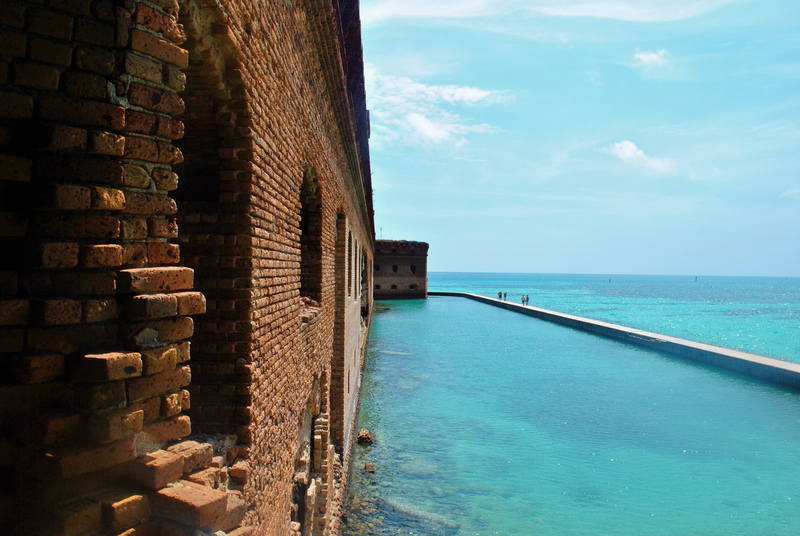 Upon arrival you can either join a free one-hour tour of Fort Jefferson or you can just do your own thing. We did the latter and we immediately went to South Swim Beach. South Swim Beach was my favorite place on the island. 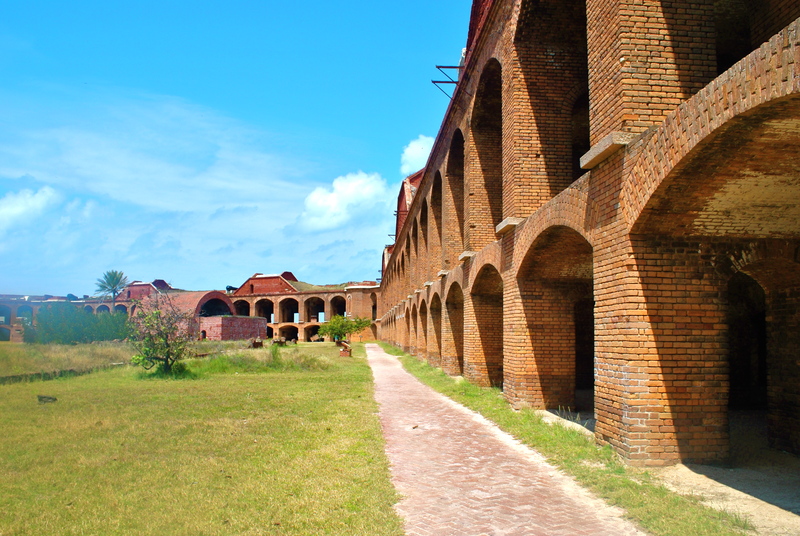 From the docking area, you can proceed to the left side and walk past the entrance to the massive fort for about 2 minutes and it will bring you to what I consider the most picturesque area in the Dry Tortugas National Park. 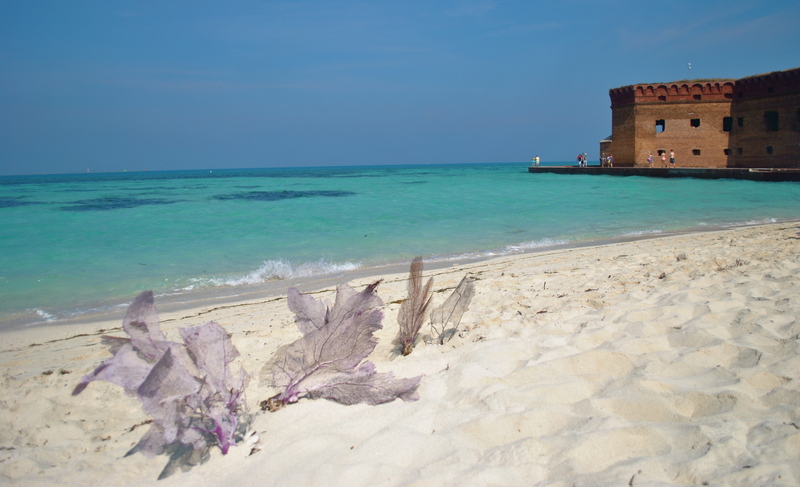 You move further south and walk past the amazing white sand beach. You will end up at this stone structure that also houses the helipad. From the stone structure, one can have this stunning scenery. This area is also one of the designated snorkeling places. Visitors would spend most of their time just lazing on this white sand beach and swimming in the turquoise waters. From this beach, one can also chance upon sea planes passing by. 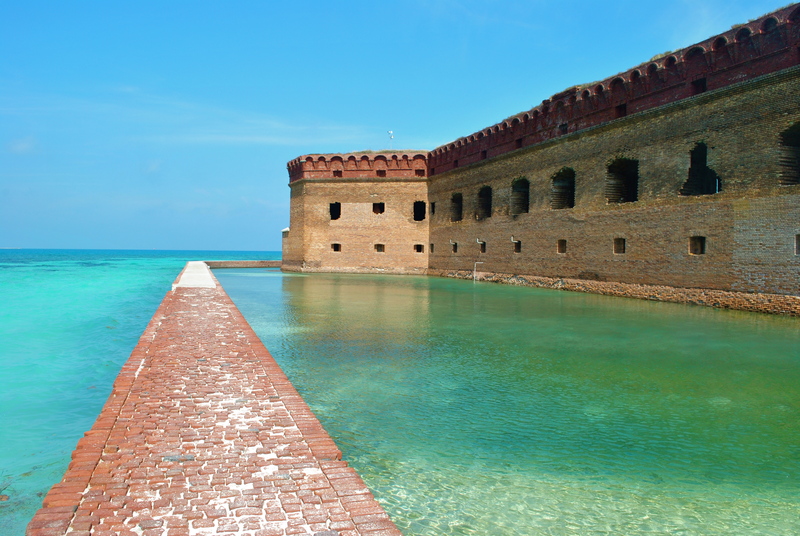 From South Swim Beach you can start walking along the south moat wall and start going around the entire structure from outside. Then you will come across your first turn to the west moat wall. We took some photos on the west moat wall. And then on the east side as well. It took us around 12 minutes to go around the fort via the moat wall. 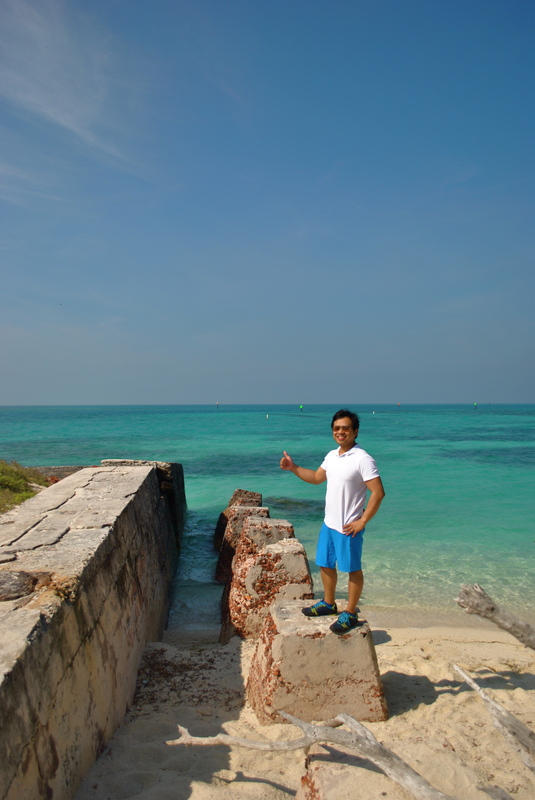 Either by going the entire walkway along the moat wall outside the fort from South Swim Beach (described in the preceding section) or taking right from the docking area to the pathway (shown above), you will be led to the less crowded North Swim Beach. This beach is shorter, less crowded and less charming than South Swim Beach. Nevertheless, this beach also has crystal clear blue waters. As I have stated earlier the Florida Keys sits on the world’s third largest coral reef and it should just be fitting to do some snorkeling around designated areas in the island. The protected waters are home to an array of extraordinary sea life. Snorkeling gears are provided free by the boat, Yankee Freedom III. 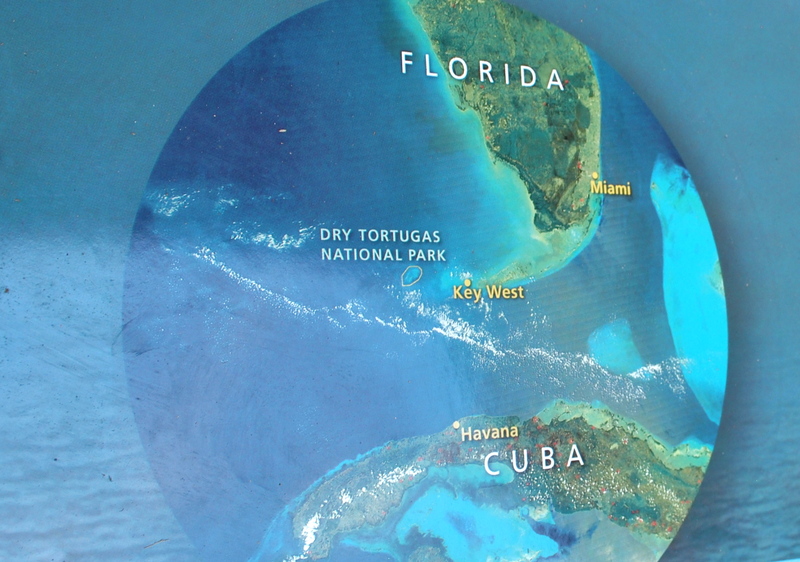 Fishing on Garden Key is also allowed at five designated areas. Fishing license is required unless you are under the age of 16 or a Florida senior resident over the age of 65. 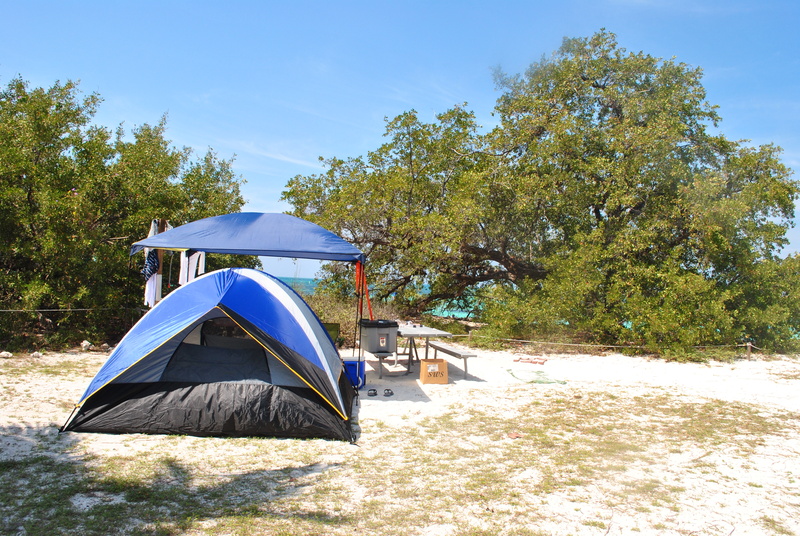 There is an option to camp on the island up to three nights and that’s what we wanted to do but we did not get camping slots anymore as they only limit the number of campers per day to around sixty-six campers at the eleven camp sites in the island. So be sure to book in advance if you want to camp. 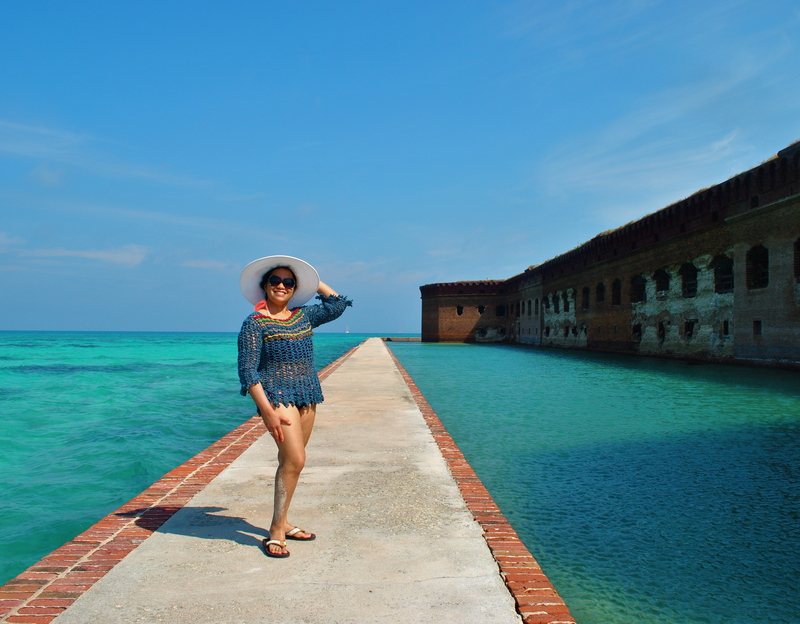 Welcome to Fort Jefferson. 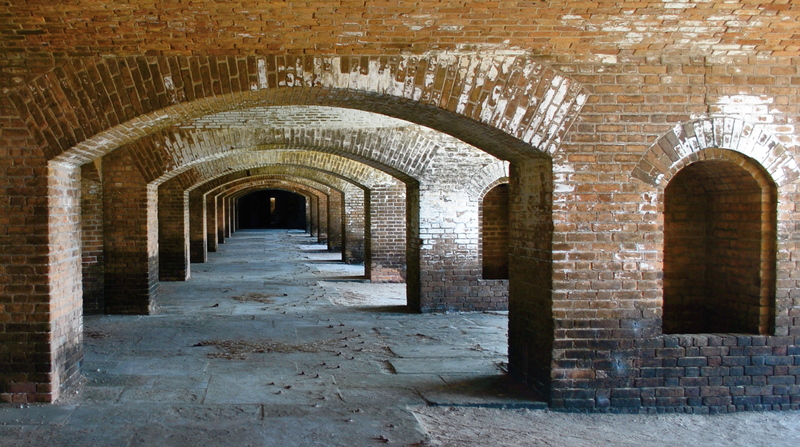 This fort was 30 years in the making but was never finished. This is harbor light as seen from the ground level. This is the ground level of the fort from inside. 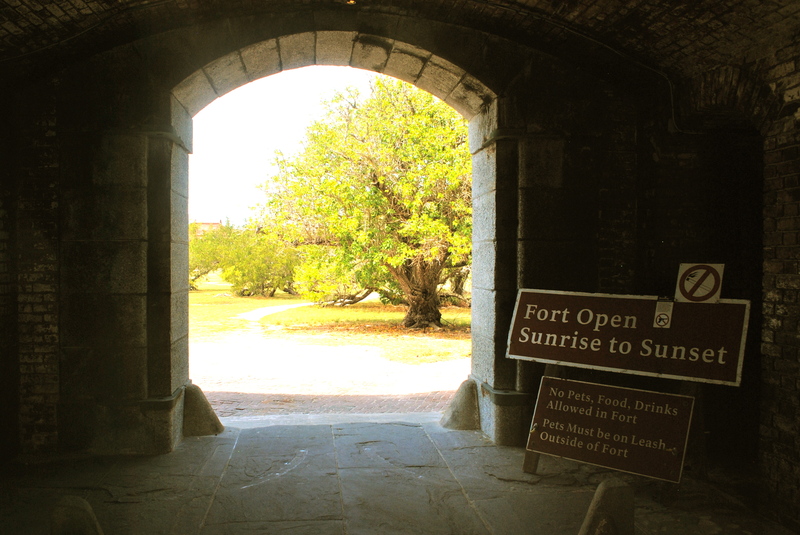 The ground level of the fort has walkways that lead to the entrance to the second level of the fort. 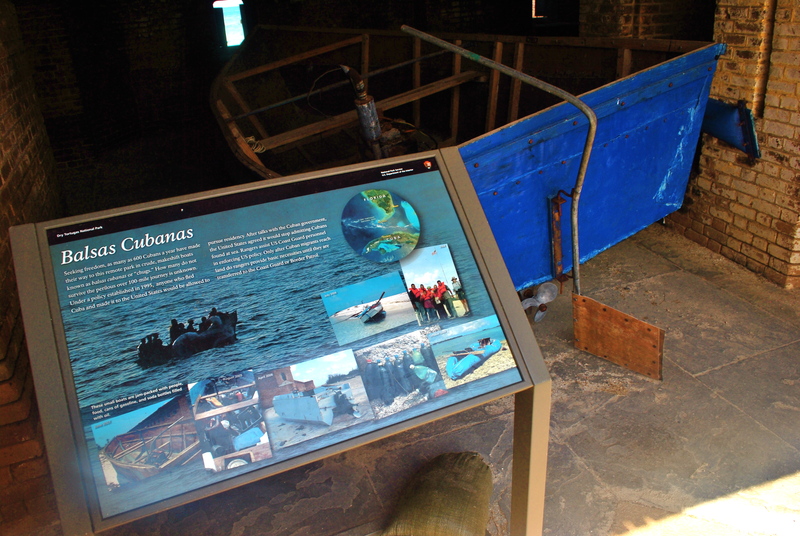 Also on display at the ground level are the boats used by sailors. 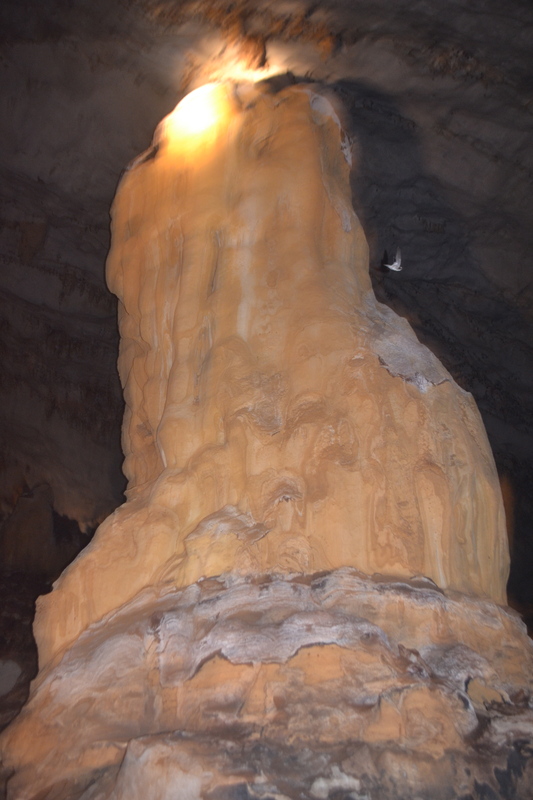 This is a part of the second level. 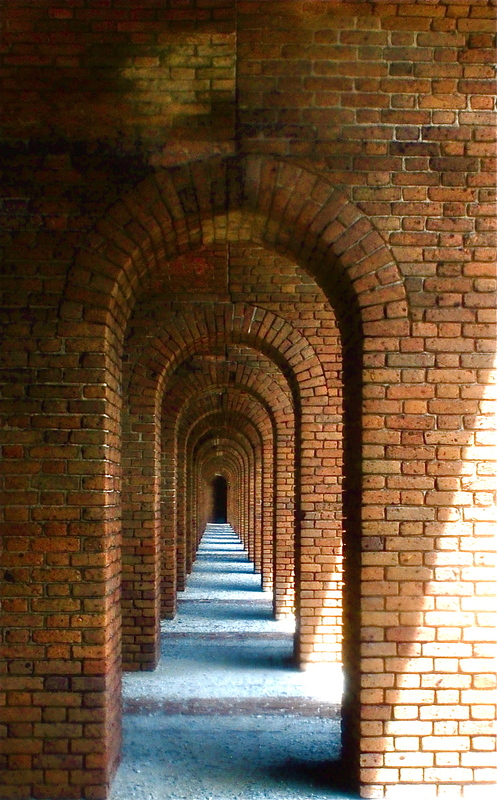 Imagine, you are inside one of the largest brick structures in the western hemisphere. 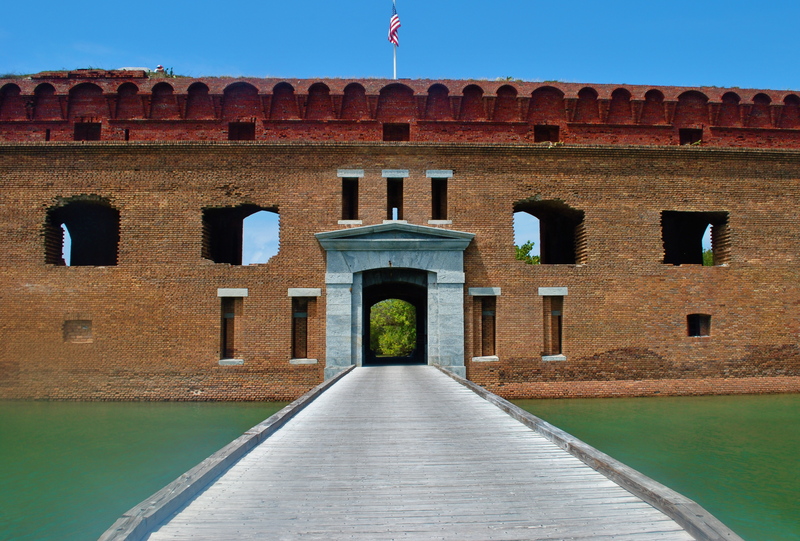 There are 15 million bricks that make up this enormous fort. 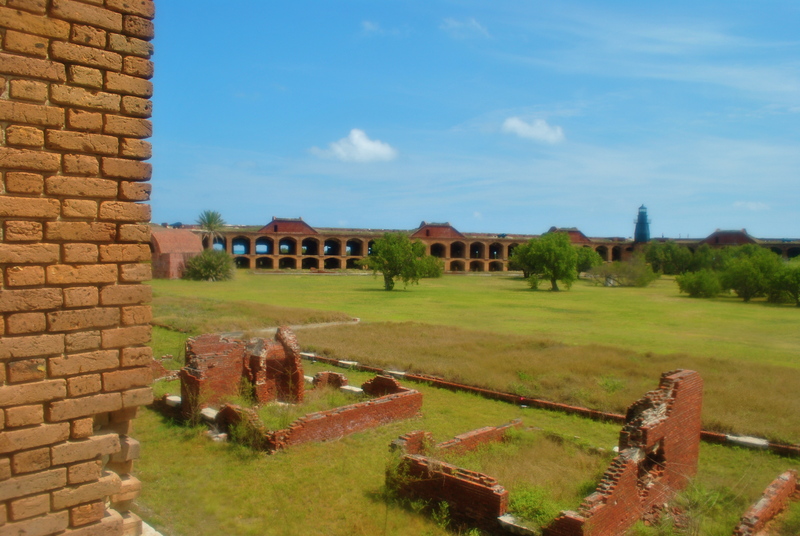 From the second level, the view of the inner part of the fort is just haunting. 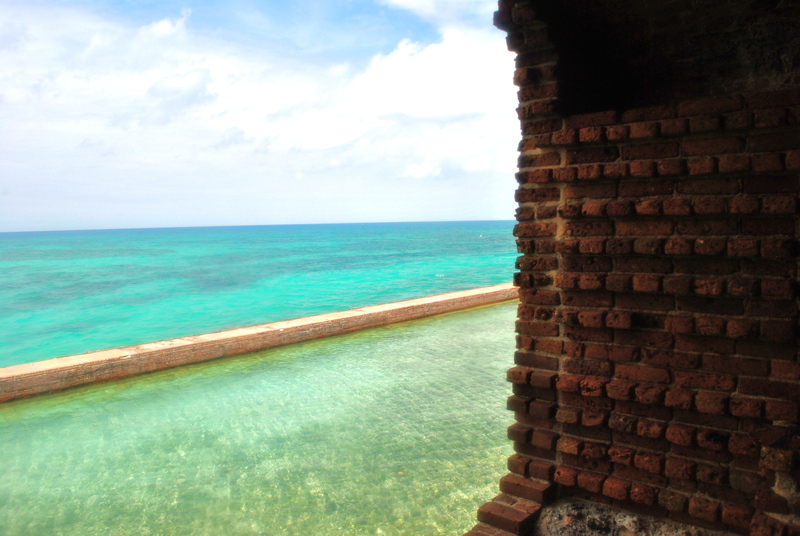 Glancing outside from the second level, the view of the blue-green sea is just calming to the eye. If you have time, you can stay put at any of the windows overlooking the waters and read a book. From the boat you can enjoy the view going to the adjacent Bush Key while having lunch. 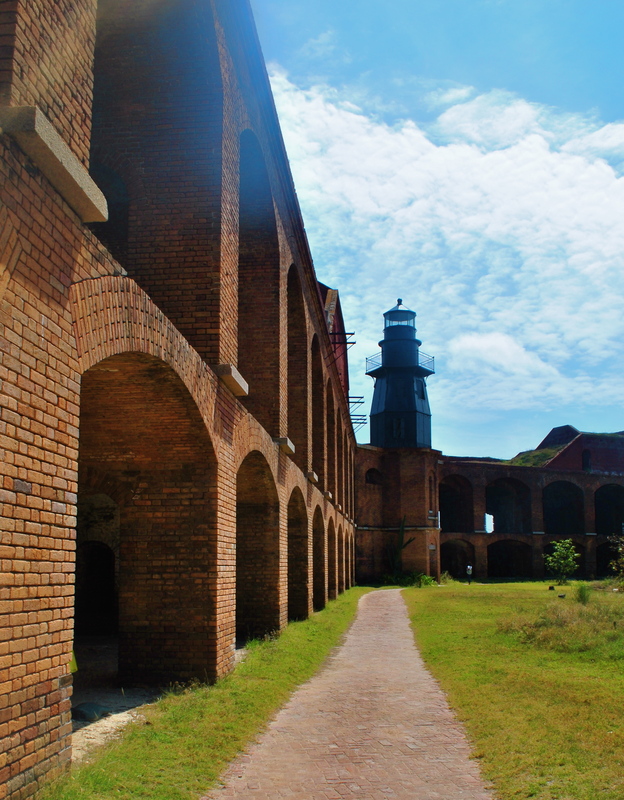 You can also enjoy views of the harbor light and part of the eastern part of the fort from the boat. The four and a half hours was really short and I wished we could have camped there for a day or two as I also wanted to experience sunsets and sunrises on the island. We left the Garden Key at exactly 3:00 p.m. and reached Key West after two and a half hours. 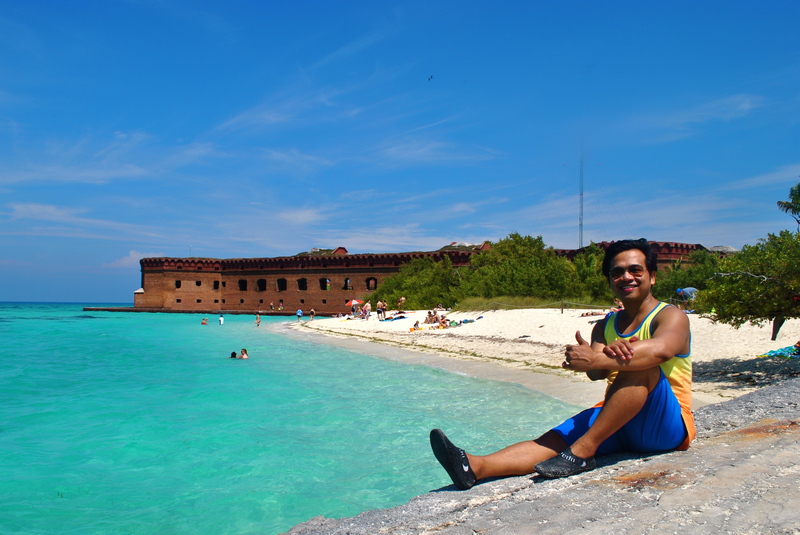 This has been my best island experience so far in the U.S.A.! The scenery was something I have never seen before. Above all, the beach was incredibly beautiful! 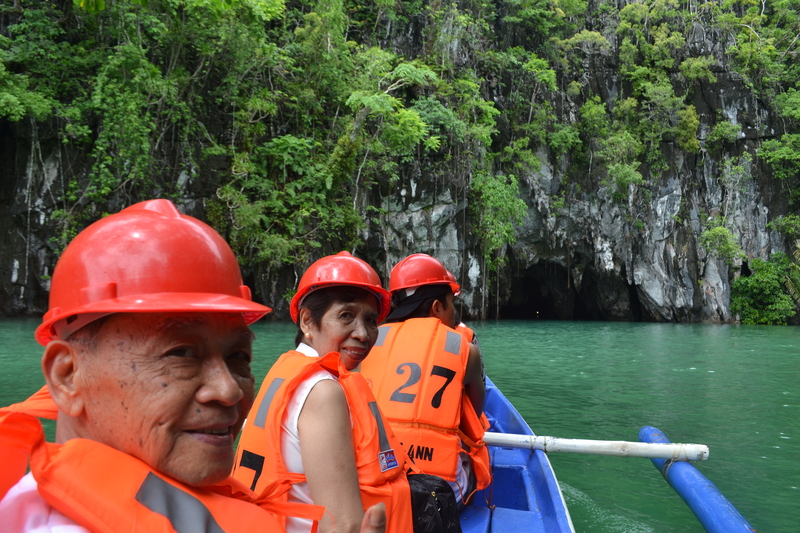 Welcome to Palawan, the Philippines’ last frontier and home to the Puerto Princesa Underground River (PPUR), recently voted as one of the New 7 Wonders of Nature and also one of the World Heritage Sites in the country. 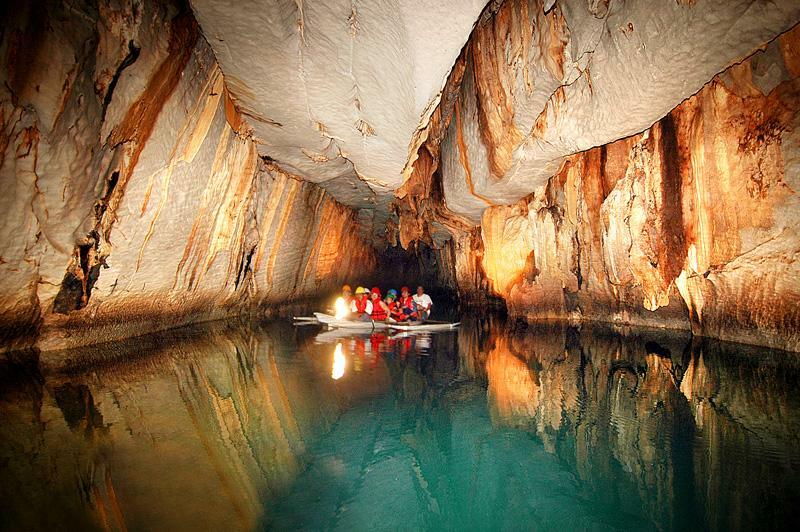 It is the world’s longest navigable underground river at 8.2 kilometers with a lot of amazing natural structures inside. 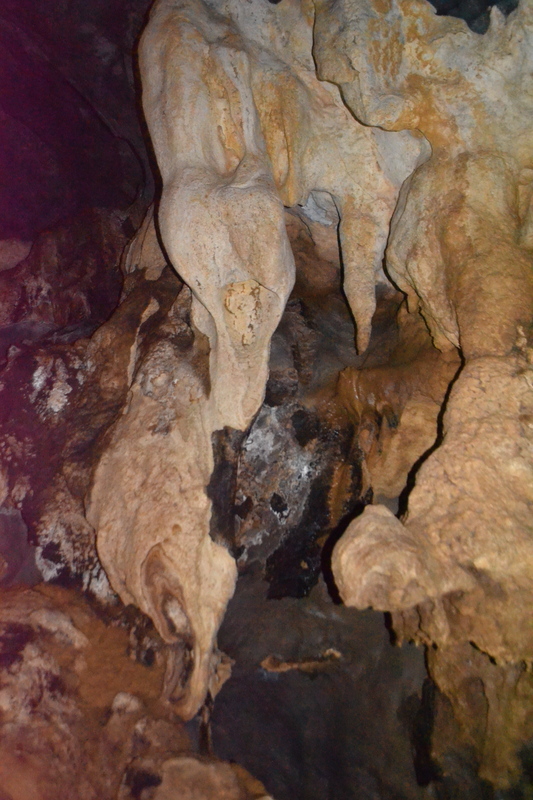 Monkeys, large monitor lizards, and squirrels find their niche on the beach near the cave. Avoid carrying plastic bags in the open as the monkeys tend to think they are food items and they could grab them. Otherwise they are harmless unless you touch them. 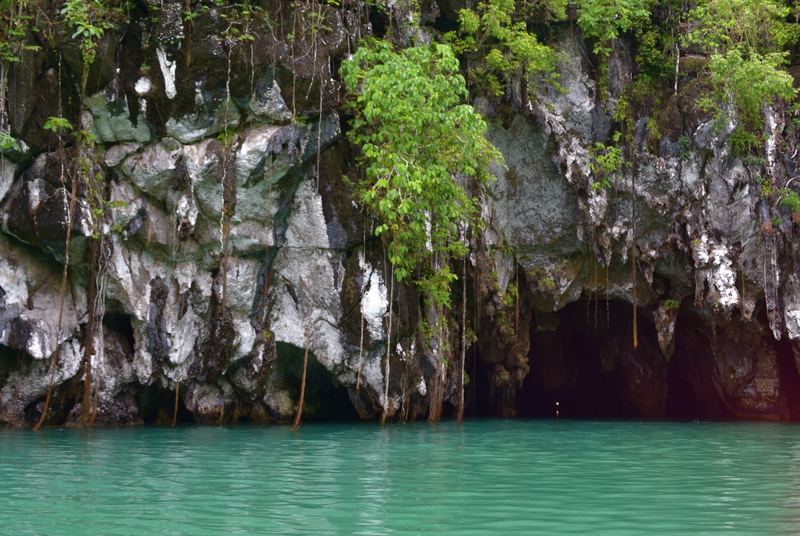 At the cave’s opening, a lagoon with clear waters is framed by ancient trees growing right to the water’s edge. 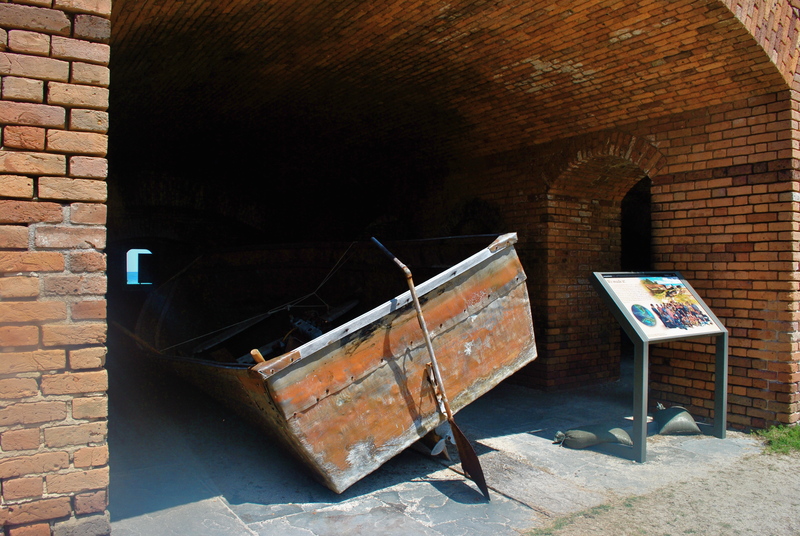 Up to 10 persons are allowed in a boat. 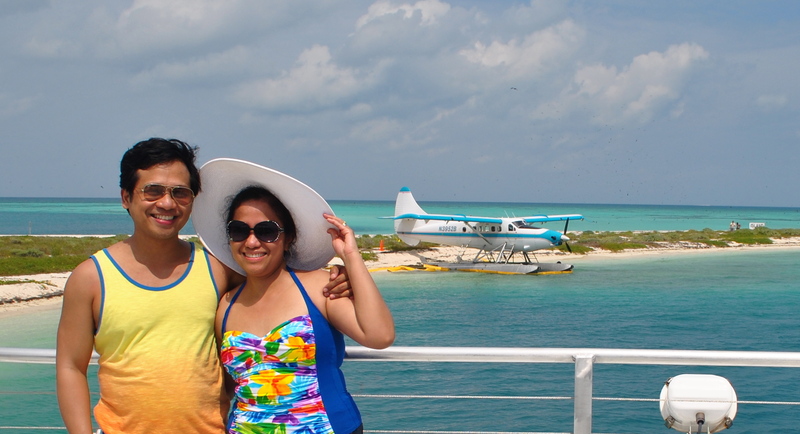 If you opt to have more privacy during the boat tour, you can nicely request the tour operators ahead of time to have your group take the entire boat. This would also depend on the crowd waiting. Our group of 5 people was allowed to take the entire boat. 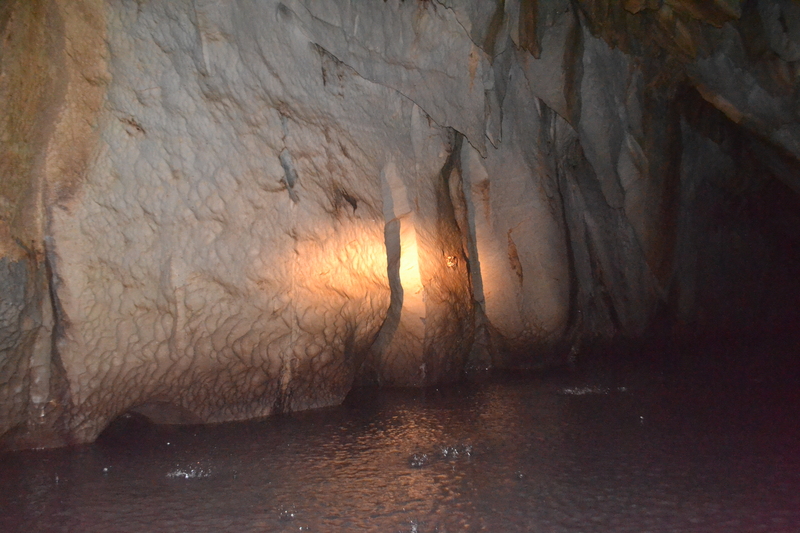 Upon entering the cave, the only light that you would have is the headlight of the boatman/tour guide. 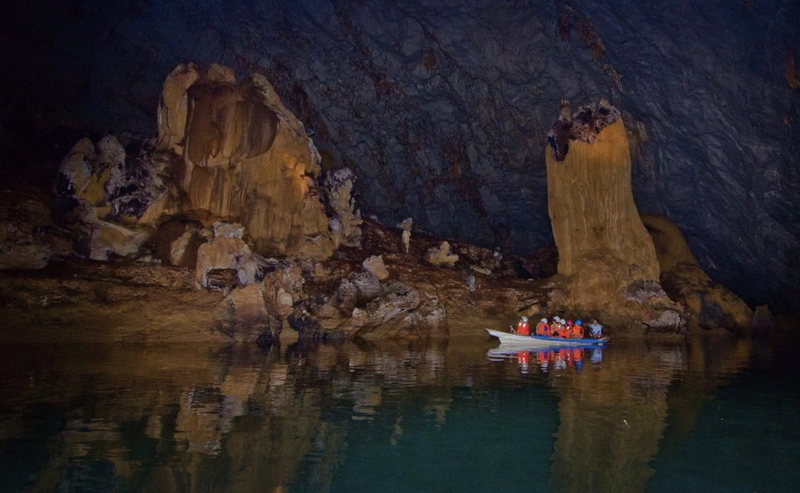 Unless you have your own powerful light, it is very difficult to rely on the boatman’s headlight for sights that you would like to capture on camera. Most of the time even camera flash is not enough. As we did not bring our own light, I tried my best to capture the sceneries where the headlight was currently focused. A female fish head with eyeliner. Lady in boots and a panda. Here you can find the giant candle among other statues. You can also spot Pegasus resting. You will then pass through the “highway”. Normally, some few more meters after passing through the highway the tour will end. 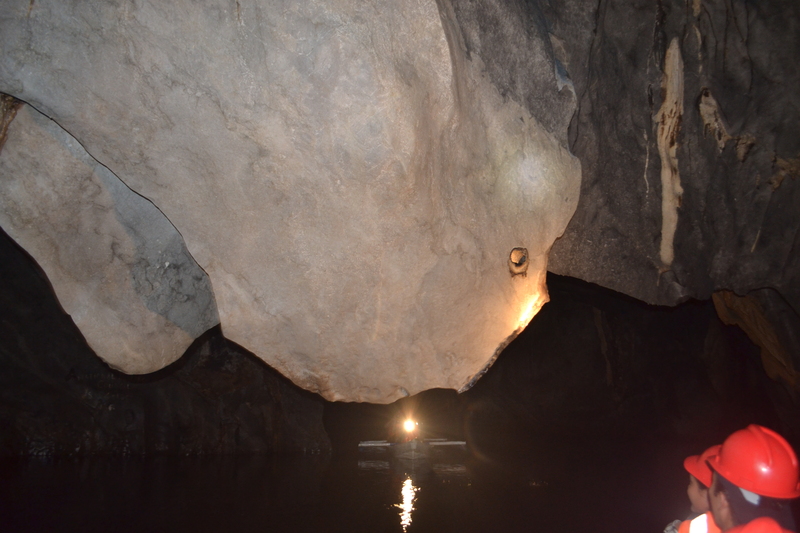 However, if you request the boatman/tour guide to take you to the sea cow fossil, then it would be another mile beyond the normal tour route. And we did exactly that! 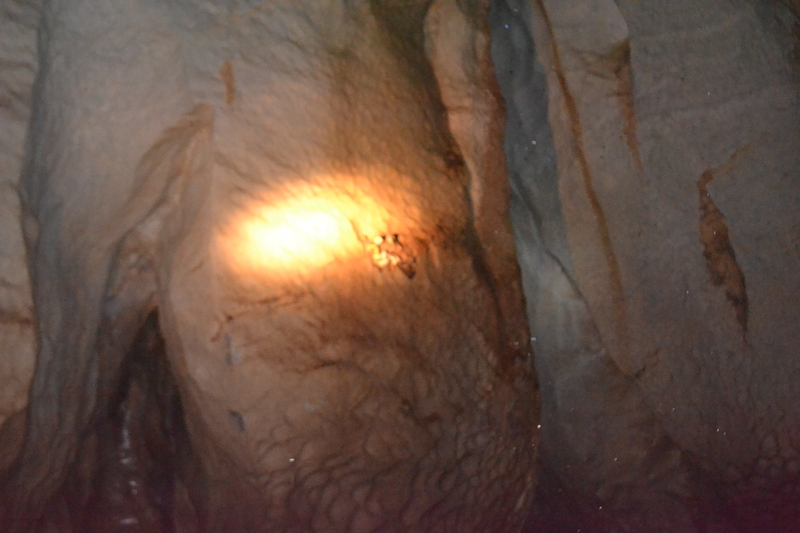 We were able to see the recently discovered fossil of the 20 million year old Sirenia, commonly know today as the Sea cow or Dugong, of the Miocene period which is plastered on a limestone wall. 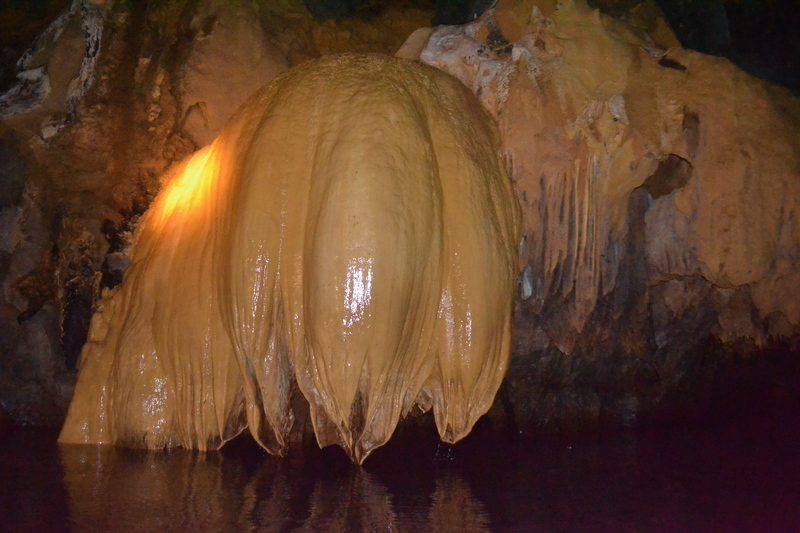 This became the highlight of the underground river tour. On the way back, you will pass the same route that you had earlier and you will have another chance to take those photos again. Finally, we were out of the cave. 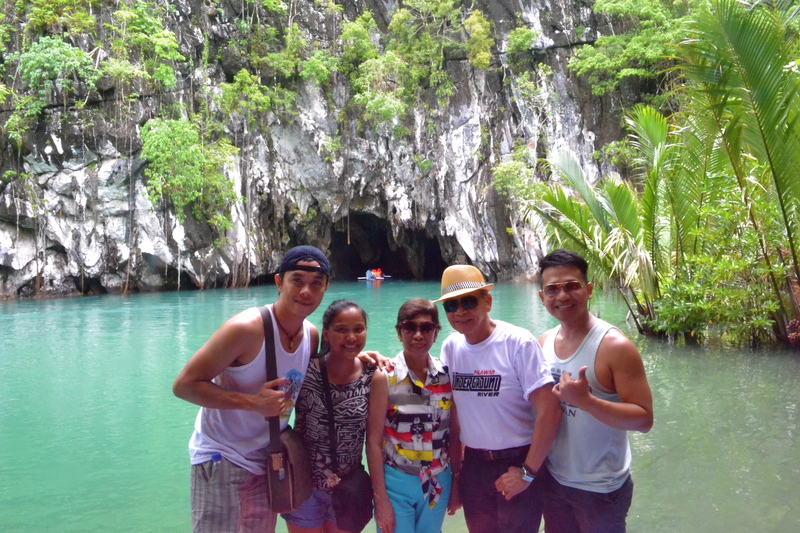 It was an experience of a lifetime with my parents and friends visiting this natural wonder right in our home country. I would like to share some things to consider when visiting PPUR. 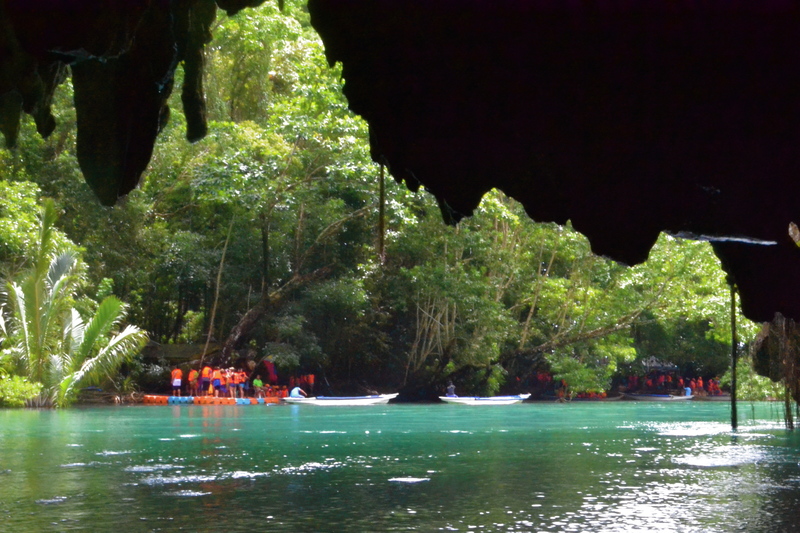 To avoid extremely choppy boat rides, you need to visit the Underground River from December until May. 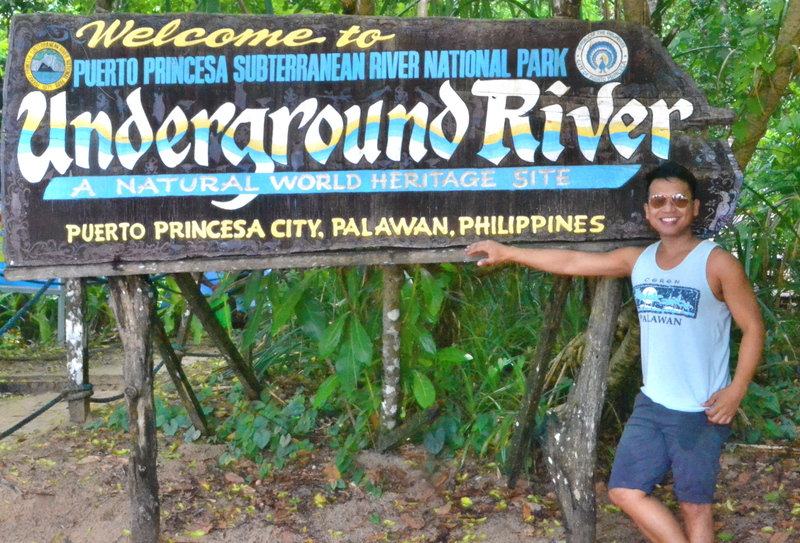 PPUR can only be reached via Palawan’s capital Puerto Princesa. Philippine Airlines, Cebu Pacific Air and Air Asia have one-hour flights from Manila to this laid back capital city that is the jump off point to many of Palawan’s other natural attractions like Honday Bay, El Nido, Taytay, Tabon and San Vicente. 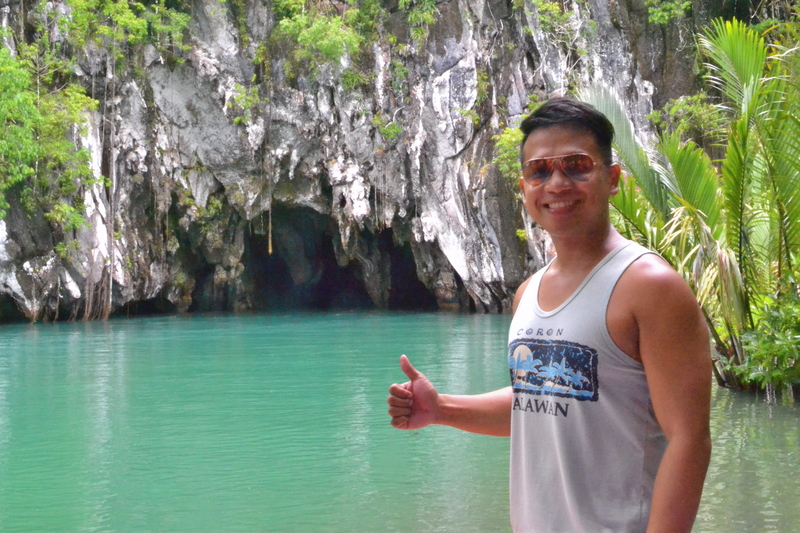 You can check my blog here on the best places to go in Palawan. From Puerto Princesa, there are a lot of vans that would take you from the airport to Sabang Beach in less than 2 hours. 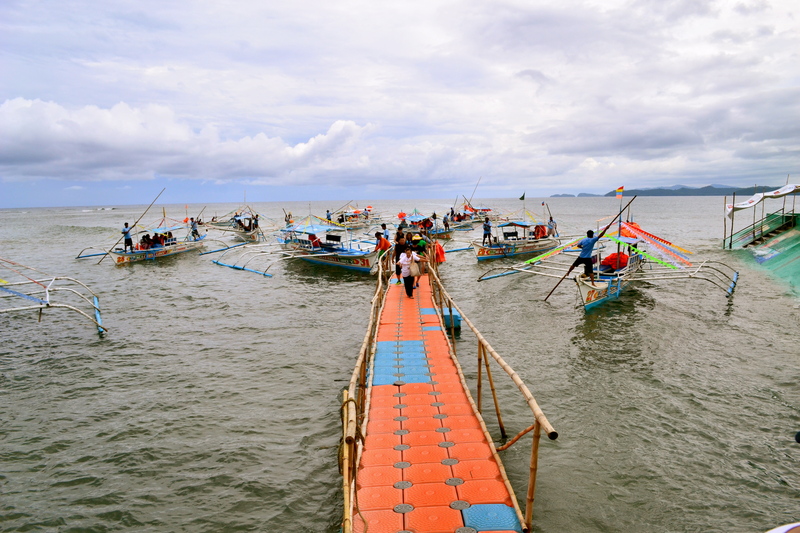 From Sabang Beach terminal, a short walk away is the port where boats are docked that would take you to PPUR. You need to get a ticket ahead of time as there is a limited number of visitors allowed per day. 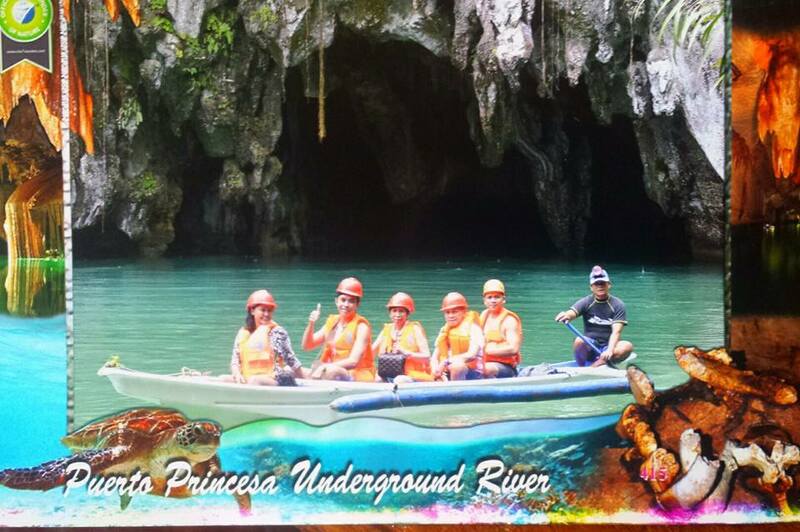 There are packages from travel agencies that would offer the PPUR tour for 1,200 pesos including the van from the airport to Sabang and back. You also need a licensed tour guide to go with you. At the port you need to wait for your name or your group’s name to be called when you’re ready for boarding the boat. The entire PPUR tour starting from the Sabang Beach port and back could be done in around 2 hours. 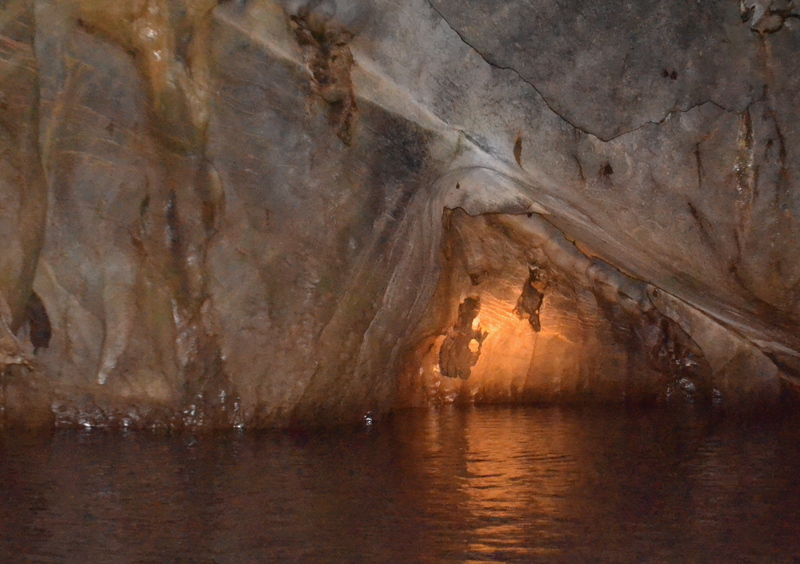 This is the area where boats would load the passengers going to the Underground River. 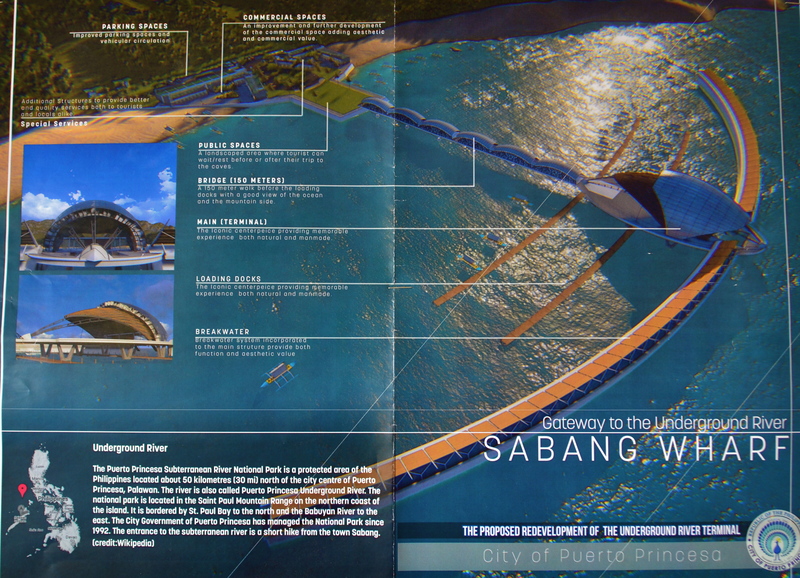 This is the future plan for the Sabang Wharf. Sabang Beach is the gateway to the natural wonder. 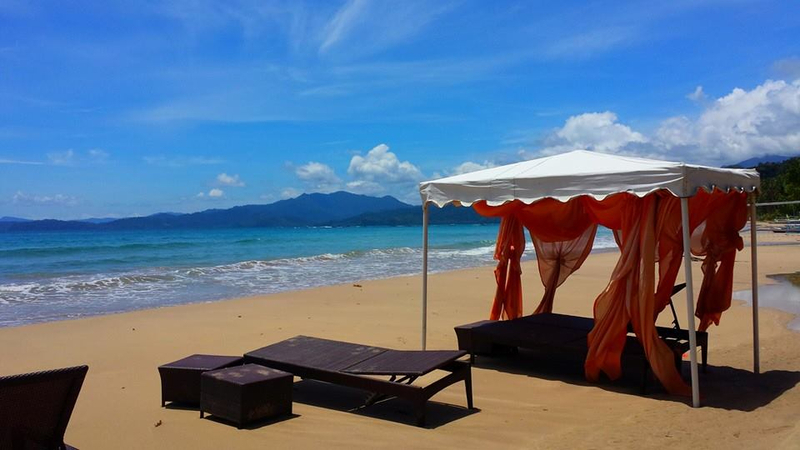 You can either base yourself in Puerto Princesa or stay for one or two nights in Sabang Beach. 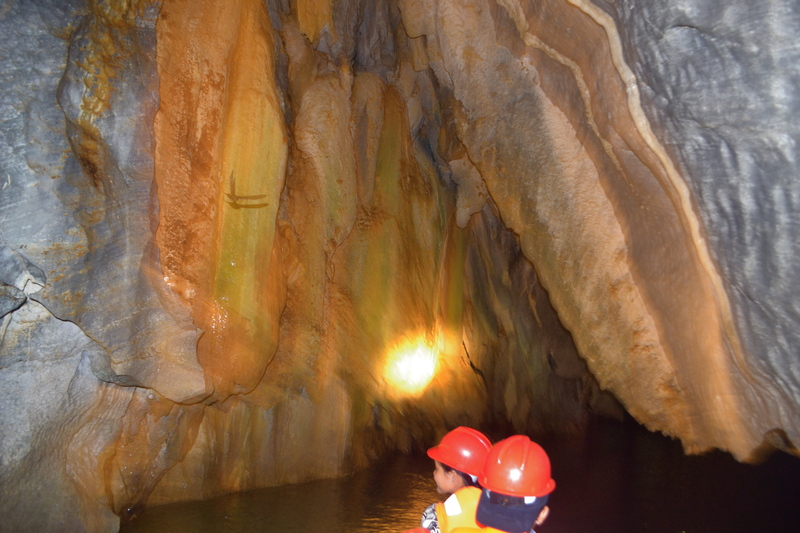 The few things you can do around Sabang Beach is to visit the Underground River, hang out at the quiet beach or ride the nearby zipline. 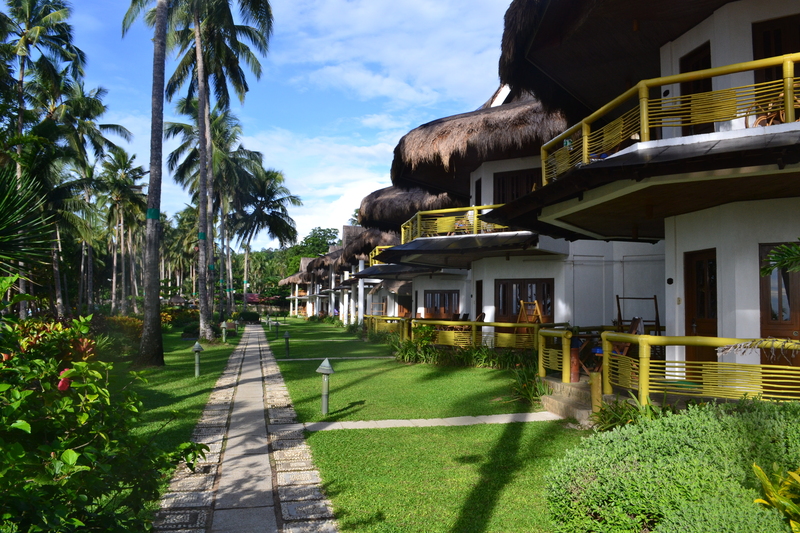 If you are checked in at the two major resorts in Sabang Beach, they have a lot of resort facilities that you can use. 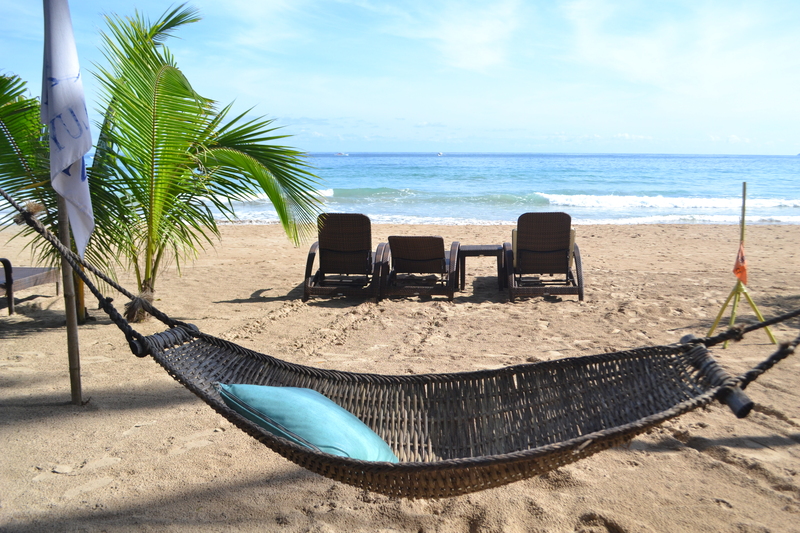 I prefer staying just one or two nights in Sabang Beach because I would rather go back to Puerto Princesa area and spend time in nicer Dos Palmas in Honday Bay with almost the same rate. 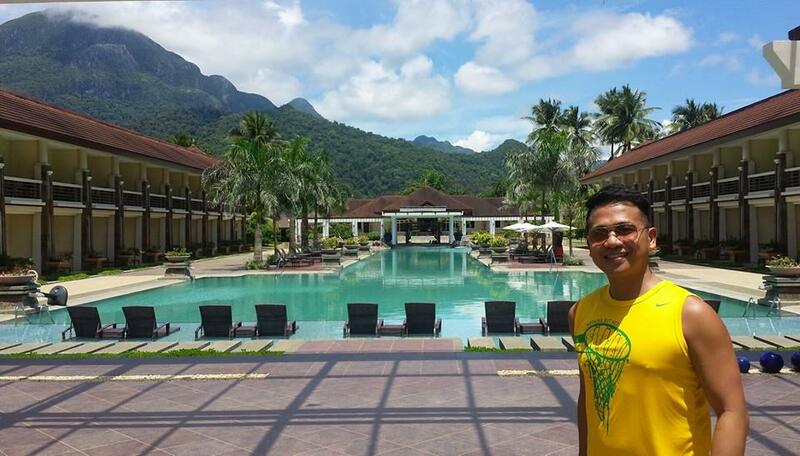 This is Sabang Beach right in front of the resort where we stayed which is discussed next. 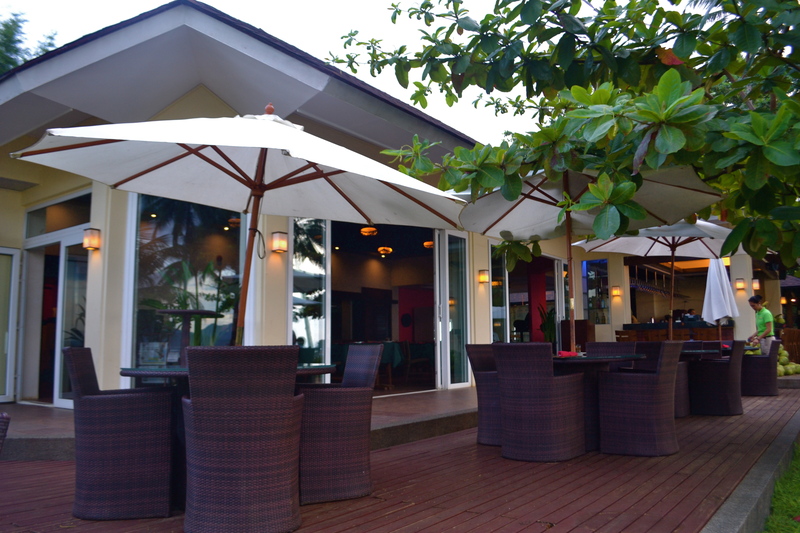 If you opt to stay around Sabang Beach for a while and just want a really simple place to stay, you can select from the many inexpensive lodging houses lining the beach. 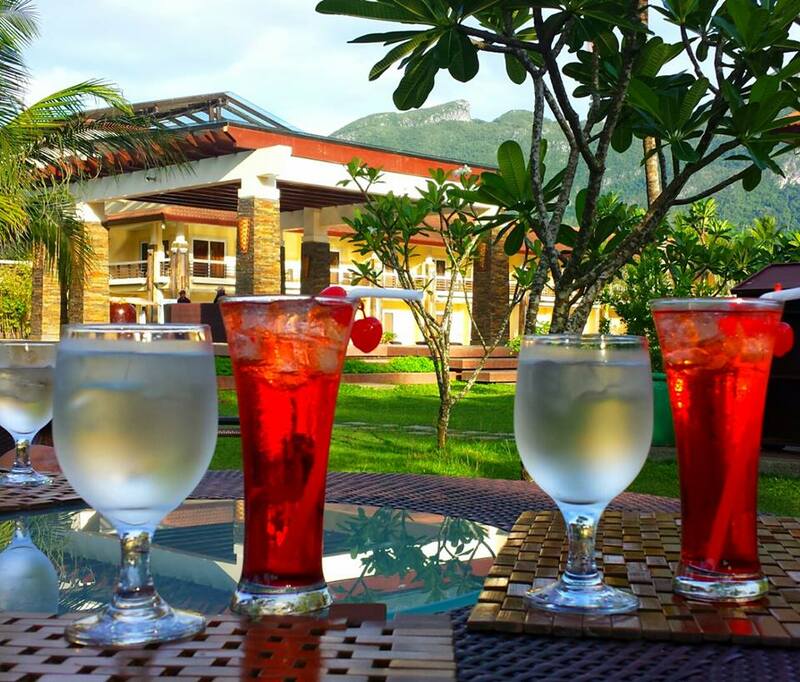 If you want a nicer place to stay, you can choose between the area’s only two major resorts, Sheridan Beach Resort and Spa and Daluyon Mountain & Beach Resort, a few steps away from each other. I have chosen Daluyon because of its more natural feel, native charm, eco-friendliness and slightly cheaper price than Sheridan. 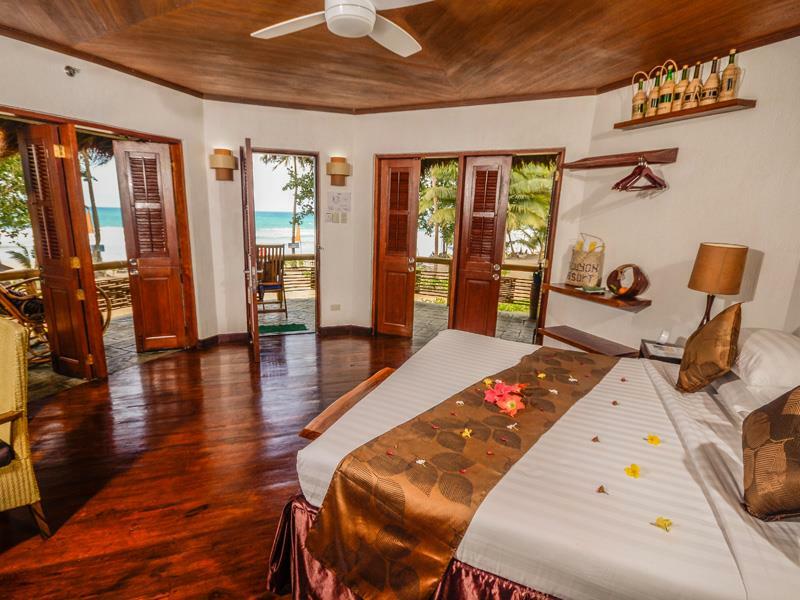 The air-conditioned rooms are all sea-facing and they are simply amazing where you can open the doors and windows for a more relaxed and airy feel. Cabana 102 was perfect for us. They also have a three-bedroom suite that can accommodate 6 persons with private pool and dining area. 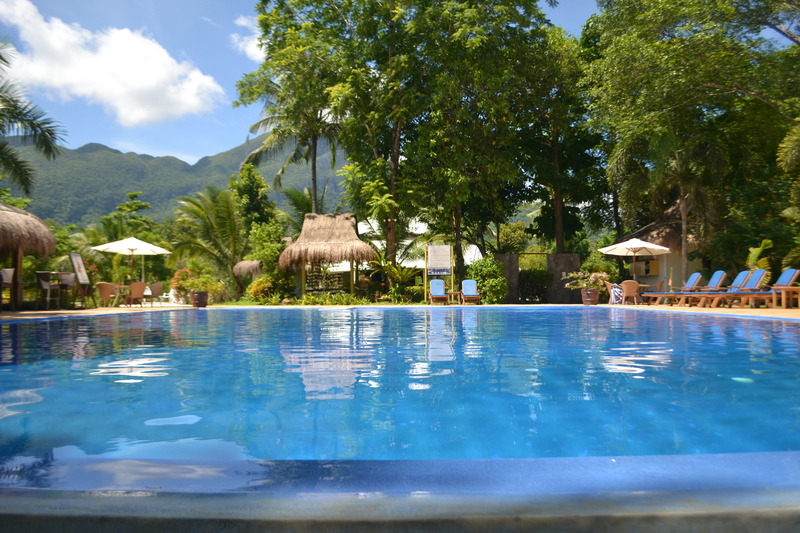 Its common adult and kiddie pools at the back of the resort have the mountain view. The resort has a really huge pool. If you like a modern place to stay then Sheridan would suit your needs. Since our breakfast at Daluyon was complimentary, we tried having our lunch at Sheridan one time and the food was good. We also had some afternoon drinks at Sheridan too. There are other smaller and cheaper restaurants lining the shore that are alternative dining options and we enjoyed them too! If you have any questions about this trip, you can leave me a message in the comment section with your email or you can email me directly at eaniban@yahoo.com.